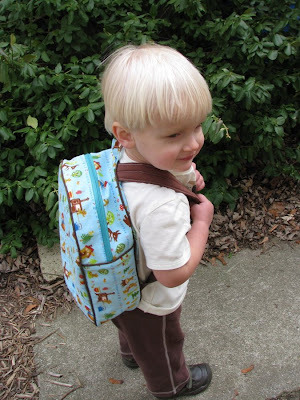 ← Almost here…Toddler Backpack Pattern! Purchase this version if you will use the pattern for yourself or for gifts for others (no profit, for personal use only). Purchase this license in addition to the pattern if you would like to sell backpacks from the pattern. Small-scale handmade sales only; one license for each person who makes/sells the bags. Design credit must be given wherever the bags are sold (“Pattern designed by Rae Hoekstra of made-by-rae.com” on tags or listings) Please register your shop with me once you have backpacks ready to sell. For more information on my Seller’s Program, please click here. The pattern uses about a 1/2 yard of medium- to heavy-weight canvas for the outside. The backpack holds its shape pretty well due to the piping and the quilted bottom, but if you wanted a more rigid backpack you could also interface it with something thick, like another layer of canvas. In addition to the outer fabric, you’ll need about 1/4 yard of 54″-wide (or 1/3 yard of 45″-wide) medium-weight fabric (I used some bottom-weight twill from JoAnn) for the straps and bottom and a small amount of fleece or quilt batting for the bottom panel and strap padding. 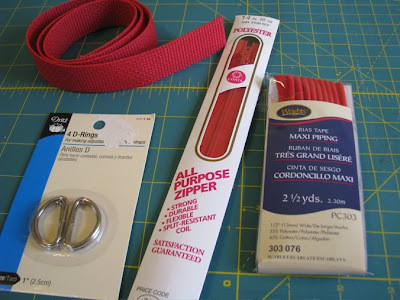 Notions: two 1″ plastic strap adjusters (or four 1″ D-rings), 3/4″ yards of 1″ nylon strap, one 14″ zipper, and one package of pre-made 1/2″ bias tape piping (2 1/2 yards total if you are a Crazy Person and think you’d like to make your own). I actually bought all of my supplies at JoAnn. The piping comes in all kinds of colors and I was pleasantly surprised at the selection of colors in nylon strap (often called “webbing”). Looking forward to the Spring Tops…actually, looking forward to Spring as well! I bought mine! I am very impressed how fast you cranked this thing out – and the pricing on the already made backpack is amazing. Someone is going to get a steal there. Just found you on here while blog jogging! You’re amazing and inspirational! Thanks for all the fun projects. These backpacks are so cute. I really need to bone up on my sewing skills so I can make one! The backpack and your model are just too cute! I know a certain toddler who would love one of these backpacks. Rae- Just wondering if you think this pattern would work for a new seamstress. I don’t have a lot of experience, but I’m ambitious! 🙂 Also, any thoughts on how long it takes to complete this project, beginning to end? Thanks and keep up the great work. I love your blog! Your stuff is AMAZING! Thanks for the free patterns! I am going to be stalking you… er. following. it’s so freakin’ cute! great job! I was coming after your Buttercup Bag pattern when I stumbled on this post about the backpack pattern. I wish Superbuzzy had more of this fabric, do you know the name they had it under. It totally makes the bag, will have to make one for my 3 year old. It’s fabulous!!! Have fun in Italy! I just tried to purchase your pattern and it says sold out. Now this is a cute backpack! Thanks so much for sharing your creativity with the rest of us!! I am SOOOOO in love with this pattern. Just made my first one and it turned out as beautifully as yours did, so there will definitely be more. 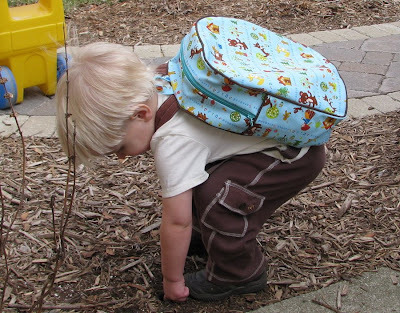 Just wanted to say THANKYOU for designing THE perfect toddler backpack! Fits all his kindy stuff in with room to spare and won't be huge on his almost 4yo back. I love this pattern. I took my daughter's choice of flannel, interfaced it with double-sided stiff interfacing and covered it with vinyl. Made it hard on myself, but my daughter LOVES it! Thanks for the pattern. Once question, where do you get your fabric? I can't find it where I am. . . I like how you're selling the pattern together with the sellers' license now. Have you thought about making that change to the backpack pattern offering? 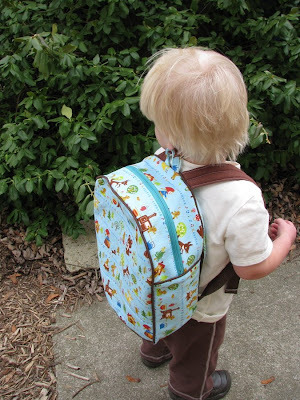 I would be interested in this awesome Toddler Backpack Sewing Pattern. Are there instructions to make it in adult size? I’m pretty new to sewing and am still learning. Is this something that is for a more advanced seamstress, or can a novice accomplish this project as well? Hi Bre: It’s not a “beginner” pattern, however if you’ve sewn a few things (especially something with a curved seam, for example, like the Buttercup Bag) the instructions are clear enough that you should be able to tackle it. But if you feel a little tentative about it, find some other projects that are more basic (Lickety Split is another great beginner project) first, ok? Don’t want you to feel frustrated!!! You rock Rae!!! I just finished a backpack for my little Gianna and it is awesome. G is only one, but hangs on her perfectly. I made the bias tape (we are stationed in England and I have yet to find good fabric selection) and I added a couple of pockets — one on the front and a pencil pocket inside. Thank you sooooo much for the pattern. do you cut the panels as they are or do you add seam allowances? you’re little boy sure is cute. I made this for my little guy’s school bag, and everyone who sees it absolutely loves it! I haven’t made my backpack yet, but I’ve gotten my supplies. I had a bit of trouble finding the nylon strapping in the color I wanted so I ended up purchasing a nylon dog leash to cut up and use… the pet shop had tons to choose from! I bought this backpack pattern last fall and made it in a day and half..It was awesome and turned out so cute. My son was so excited to wear it for his first day of preschool! I will say it did start to separate at one of the seams after he wore it a few times but I think that was due to my sewing and not the pattern! I will make him another one for next year! Hi Rae. My son is a (small) four-year old who is starting preschool this fall. I love your backpack, but wondered if it’s labeled “toddler” for a reason? Do you think it’d be too small for him? Thanks! Do you think your pattern would work using a laminated cotton, like they sell on the superbuzzy website. If so, how do you think it would pair up with the quilted bottom?? Would love to make this for my little boy! I am at an intermediate level with sewing. What is the approx. time it would take to make one of these? I would guess about 4 hours? Hard to say though — it really depends on how focused you are. The project is not difficult, but it does have quite a few steps. I just made two of these little beauties for my youngest two! It took a little thought with some of the steps, but I love how they turned out! I did add a pocket to the front and an elastic topped pocket to each side. Great patterns Rae! I. Love. This. Pattern! I made my little guy a bag for our trip to NY! I plan on making another one for him once we get home. Thank you for such a great pattern and tutorial! I made 2 of these backpacks for my kiddos. I used a quilter’s weight cotton and a fusible firm interfacing. However, after a few days of use, they’ve started to collapse on themselves and aren’t holding their shape. Is there anything I can do at this stage? Or some tips for backpacks I’ll make in the future? I’m working on one for my second son (see above–haha) and I have a question on the lining. In step 4, it’s obvious that I have to sew the pieces that I pinned, but I’m not sure about the seam allowance. Any guidance? Thanks!